Develop your STEM skills in our fun, interactive computer day camps for high school students. Topics include 3-D animation, virtual reality, big data, and game design. Our one-week camps provide hands-on learning opportunities that improve students’ computer skills. Faculty from the School of Informatics and Computing teach the sessions and help students to explore in-demand career options. We’ve designed our summer computer camps just for high school students. Only students entering grades 9–12 may register. We’re sorry, but teachers, middle school students, and international students may not attend. Current high school juniors graduating high school in 2019 who attend a weeklong day camp are eligible for a $500 college scholarship upon admittance to the Biomedical Informatics, Informatics, or Media Arts and Science programs at the IU School of Informatics and Computing at IUPUI. Drop-off is between 8 a.m. and 8:30 a.m.
Pickup is between 4 p.m. and 4:30 p.m. There will be no adult supervision before 8 a.m. or after 4:30 p.m.
Students must bring their own lunches. Need-based scholarships are available for covering the cost of our summer technology camps. These scholarships are awarded on a first-come, first-served basis. Students will be asked to submit a 100-word essay describing how they will benefit from a computer camp, and a letter from a teacher or a guidance counselor stating financial hardship or need. Have you heard of the HTC Vive Pro, IQ-Wall, or the cy.PIPES 4-D device? Researchers at Indiana University use virtual reality gadgets every day to study complex problems and create amazing experiences. 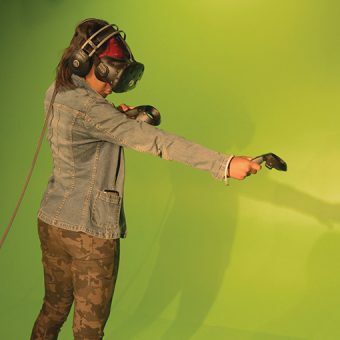 You’ll be introduced to a wide range of VR gadgets, and you’ll create your own virtual worlds using the HTC Vive and 4-D effects like wind and heat. You don’t need previous experience coding or scripting, but if you have it, you’ll advance those skills. Are you enthralled by PlayStation 4 or Xbox One games? Do you have an idea for a gaming world that you want to bring to life? Take advantage of this unique opportunity to become a beginning game developer! Using Unreal 4—the world’s leading game engine that was used to create “Batman: Arkham Asylum,” “Gears of War,” and the “Final Fantasy 7” remake—you’ll learn to create a fully playable, original 3-D world complete with lands, buildings, and all kinds of objects from the world of gaming. You won’t need previous experience. Films, games, commercials, visualization technology, printing, virtual and augmented reality—all these industries are using 3-D in new, different, and exciting ways. The 3-D and visual effects industries are growing, and you can be the next 3-D creator. 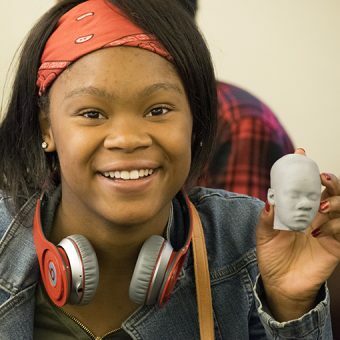 You’ll learn to use tools to create 3-D printed art or 3-D video—or both—and you won’t need previous experience with 3-D software. At the end of this course, you’ll leave with your own 3-D creation. Artificial Intelligence is essentially an extension of our computing ability and human evolution with technology and digital transformation. This course will help you examine the crucial and consequential relationship between AI and humans and use your imagination and creative instincts to explore the design and basic blueprints of combining AI with Human Intelligence (HI) in the co-creation of technology and relationships. You will analyze scenarios of self-learning AI systems and assess some unintended risks of human interaction with potential future intelligent machines. You will also learn linking the dots, one of the main principles in AI using data representation tools and applications, and you’ll practice building and using Databots in Python. Do you love creatures and aliens? Do you have a sketchbook full of original creations? Now you can bring them to life through technology! You’ll learn to draw, animate, and create a creature, alien or other characters to share with your friends and family—and how to use the Spore Creature Creator Engine. To help bring your creations to life, you’ll study myths, legends, biology, and evolution—and how your creatures fit into video games, comic books, movies, and more. You’ll also explore the creation of Pokémon and its worldwide success. Anyone can make games without prior experience. So, let’s get to making them! This workshop will focus on the core features of game development using the Unity game engine, a standard in the game design industry. Expect lots of code, lots of discussion of the game development industry, lots of focus on making cool stuff in the engine – and then showing it off to your classmates and playing their games! By the end of the week we’ll have made a 2-D platforming game, some cool particle effects, done some exploration in 3-D, and even tinkered around in virtual reality. Note: The Week 1 Game Design camp is not required to participate in this session. With the development of computer and information technology, enormous amounts of biomedical data have been captured for improved health care. These data range from electronic health records to medical images to genetics, also including nutritional, lifestyle, and social-economical information. Biomedical informatics employs IT skills and computational methods on biomedical data for scientific inquiry, problem-solving, and decision-making in health. You will learn not only the fundamental analytical skills and existing bioinformatics/computational methods for human genetic data analysis (such as DNA, RNA, and protein sequencing data), but also discover how advanced virtual reality (VR) and augmented reality (AR) technologies significantly benefit medical treatment and human health management. Students will have hands-on practices on real-world biomedical data to exercise these skills.